This entry was posted in photography, Wildflowers and tagged nature photography, photography, wildflowers, yellow tarweed by foresterartist. Bookmark the permalink. I don’t have a new name, but I often wonder who got to pick all the weird names. Botanist no doubt. They’ve got their noses buried in the latest copy of Munns! They need an artist name advisor. Yes, I love it! That’s it Joy, I hereby appoint you as Chief Advisor to the Botany Committee for Replacement of Terrible Wildflower Names. Congratulations, your salary will be commensurate with the importance of this position. Don’t call us we’ll call you. Tarweed is an awful name for such a beautiful flower. I think any name with the word “sun” in it would be more appropriate, provided it wasn’t then followed by the word “weed”. Agreed CM! Sunweed sounds like a new marketing new in the California cannabis market. Tikweed is another misnomer for a flower that looks a lot like this one. The Merriam Webster dictionary says tikweed’s real name is pennyroyal. Maybe this one has a “real name” too. Wikipedia says its scientific name is “madia elegans”–so at least somebody perhaps thought it was elegant (one of the many translations I found for “elegans”). Indeed Alli! You give me fresh hope for our botanist brothers and sisters. I will have to investigate this further. 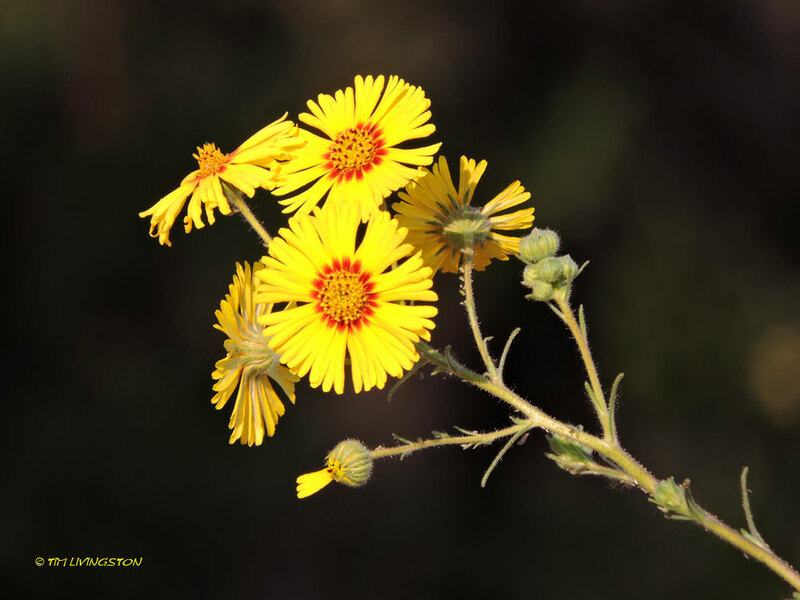 I found “showy tarweed, elegant tarweed, common tarweed and common madia. Some were better and some worse. Those were different subspecies. Let’s see “Golden Dawn flower” vs “tarweed”. No brainer here, tarweed is out! How about Rays of Sunshine? I knew I could count on you to come up with something poetic Linda! Much better sticky pest plant.